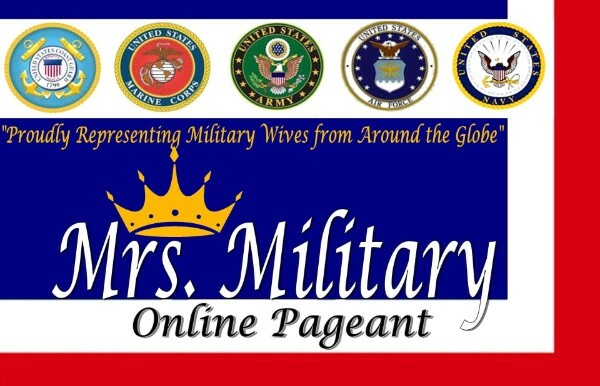 Mrs. Military is an Online Pageant dedicated to all the women in this world that are married to the Military. This pageant was founded by the military spouse Valora Fanell who holds the winning titles: Miss Germany Intl. 2009, German Bikini Model 2010, Miss Motors USA 2010, Miss Princess of Germany 2010 & Miss Petite U.S. North America. The judges for this competition will be a beauty queen, former Mrs. Military and an experienced military spouse. This Pageant was designed as an online pageant so you can enter no matter where you are stationed in the world. You can only represent your duty station not a country or state.